Bob Dylan is many things to many people. Folk prodigy. Rock poet. Quiet gentleman. Dionysian impresario. Cotton Mather. Stage hog. Each of these Dylan creations comes with its own accessories, including a costume, a hairstyle, a voice, a lyrical register, a metaphysics, an audience, and a library of commentary. Each Bob Dylan joins a collective cast that has made up his persona for over fifty years. No version of Dylan turns out uncomplicated, but the postmillennial manifestation seems peculiarly contrary-a tireless and enterprising antiquarian; a creator of singular texts and sounds through promiscuous poaching; an artist of innovation and uncanny renewal. This is a Dylan of persistent surrender from and engagement with a world he perceives as broken and enduring, addressing us from a past that is lost and yet forever present. 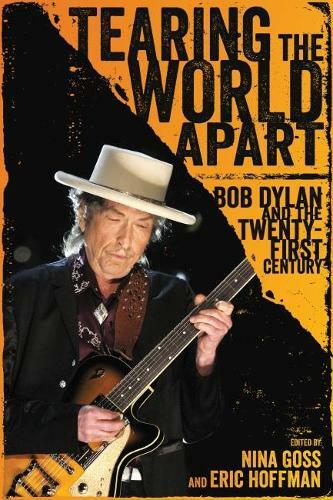 Tearing the World Apart participates in the creation of the postmillennial Bob Dylan by exploring three central records of the twenty-first century-"Love and Theft" (2001), Modern Times (2006), and Tempest (2012)-along with the 2003 film Masked and Anonymous, which Dylan helped write and in which he appears as an actor and musical performer. "Tearing the World Apart offers eleven lively ways of looking at Millennial Dylan. Each essay, like a good Dylan song, stands on its own merits and suggests rich trails to follow. First-person observations, close readings of Dylan's twenty-first-century music and film, and contagious joy dance together between the book's covers. I learned much, took many notes, went down some new trails, and sang along the way."